David Luiz to Arsenal rumours have been gathering momentum lately, with some sources going as far as saying the Chelsea superstar could be set for a move in January. The transfer window is open and it is expected that Arsenal will be amongst the busiest clubs in the window. The likes of Alexis Sanchez and Theo Walcott are expected to leave the club whilst the Gunners will be hoping to recruit fresh legs as they look to do battle for any of the top four spots. 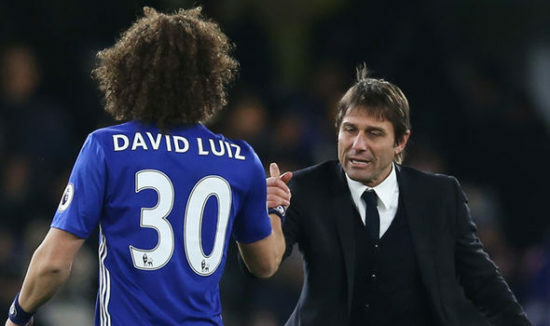 One of the players strongly linked with a move to Arsenal is Luiz who has also been linked to Barcelona, having fallen out of grace at Stamford Bridge after a bust-up with Antonio Conte. Reports suggests that Barcelona are no longer interested in the defender, leaving Arsenal in pole position to sign him. However, Arsene Wenger, in his inimitable way, has come out to pour cold water on such reports suggesting Arsenal would sign Luiz after all. As culled from Goal, the manager was quoted as saying, “These reports are wrong,” he said. Luiz, who currently nurses a knee injury, has made just eight Premier League appearances this season. Whilst the Chelsea fans may not like to see him leave for the second time, they know Conte is capable of selling any star that questions his methods.